The current rally is running out of steam or should we say sugar. The only things recently that have been pushing markets higher has been domestic economic news and rumors of QE. But even those press releases can’t hold up any one day chart. Today we got news that the Dallas Fed Index recovered from the big drop that occurred last month. This helped Boost the market but the rally faded into the day. The only index that finished in the green today was the tech heavy Nasdaq which was only up due to the heavy weighting of Apple (AAPL) within that index. Why might you ask was Apple once again rallying? Cool phones? Space Station designed headquarters? Possible brain replacements with cool multi colored see through computers? Well some of those… but seriously Apple just got a major decision from their truly historic patent trial with Samsung. The jury found Samsung had infringed on the majority of Apple patents and Apple to not have infringed on any of Samsung’s. Some of the big infringements where double-tap zooming and scrolling. The Jury put forth the recommendation that Apple be awarded more than $1 Billion in damages. Apple’s stock finished up 1.88% today and closed at $675.68 a share. The stock has slipped 18 cents in after hours. D&D Investments would advise shaving a bit off your Apple holdings to lock in these current all time high gains, which D&D infact did today. Even in a correction Apple could get hit on any given day and create a great buyback opportunity. It’s always good to do both fundamental and technical analysis. Sometimes it can be very easy. When you take the timing of the release of the Dallas Fed news and compare the intraday Dow or S&P 500 chart you can clearly see the reaction in the markets and the lack of follow through conviction. Also the chart highlights the current bi-polar state of the market where bad economic data leads to QE (good for markets) but good economic data leads to no QE (good for the economy). Investors are beginning to wonder just what will or will not cause a rally going forward. Then down in Florida we have the RNC (Republican National Convention) going on… albeit Hurricane permitting. The speeches there will help investors and voters a better idea on the policies that Mitt Romney and Paul Ryan are putting forward for the direction of this country. 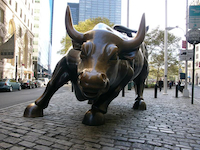 Today the DOW (INDU) fell -33.30 point at -0.25%. The S&P 500 (SPX) lost -0.69 points at -0.05%. 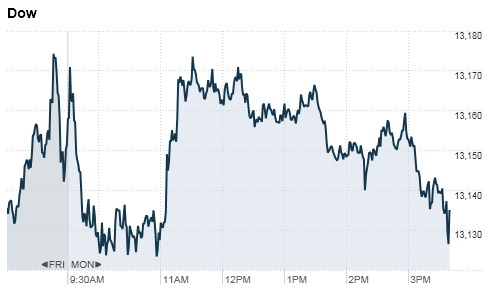 The Nasdaq (COMP) rose 3.40 points at 0.11%. Oil fell 48 cents to close at $95.67 a barrel. Gold rose $2.70 to close at $1,675.60 an ounce. The 10-Year Note gained pushing yields down to 1.65%.